When you look at this serene house you can almost hear the waves of the beach and feel the sand between your toes. 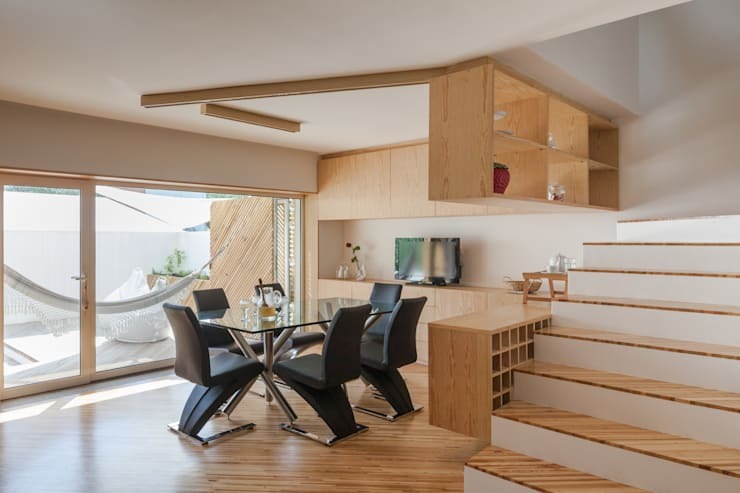 This is the Silver Wood House designed by architect Ernesto Pereira for two clients, Marisa and Rui, who gave him an unlimited budget and as much time as he needed to build them a dream house. The result is a truly spectacular home that meets all of their needs, tastes and routines. What's even more surprising is that this project was a renovation, not a fresh build, and yet the new home looks absolutely one-of-a-kind. 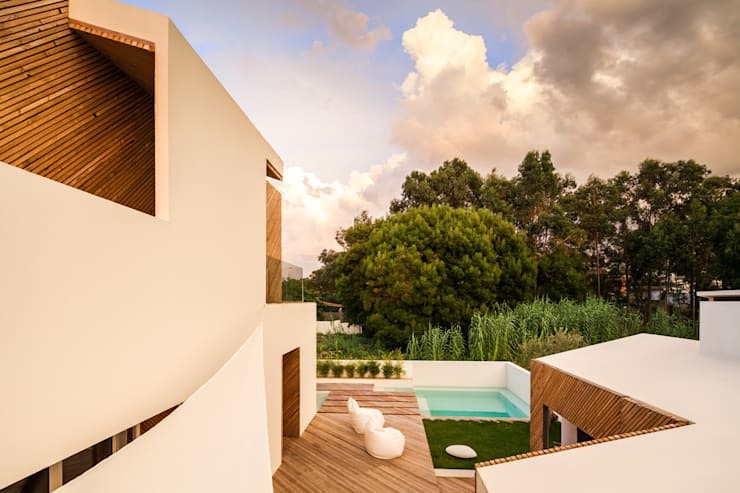 The Silver Wood House has been photographed by John Morgado Architectural photography, so lets take a look their shots of this ocean paradise. It's immediately clear that this house is eye-catching, with its huge white exterior and extraordinary shape. We think we see the bones of the old farm house in the peak of the roof, but every other corner of the design feels modern and exquisite. It's interesting how Pereira has used his second material, the angled wooden boards, to emphasize the depth of the house. The wood makes up the back of the balcony and the back of the front door, drawing the eye in and making that white exterior all the more dramatic. 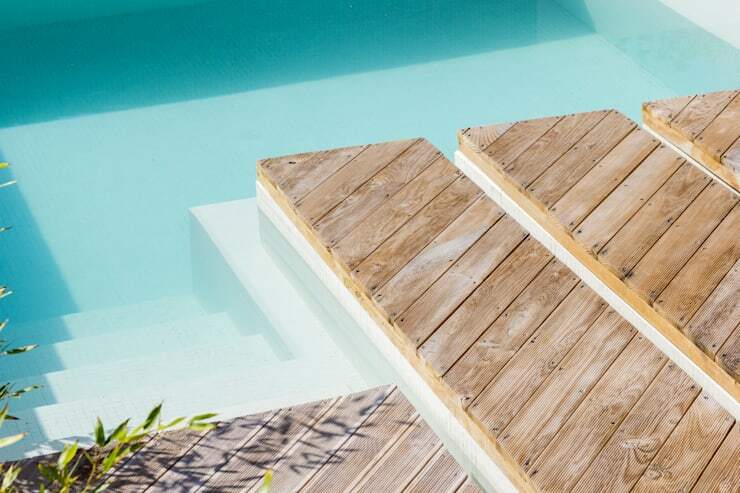 This wood pattern used on the deck is found everywhere in the home's exterior and interior. It's worth taking a closer look at the angles created by the wood that lend the material the feeling of movement. If the panels were straight up and down, or horizontal, the texture wouldn't be as interesting or as dynamic when seen from afar. More on this later. We had to show you this image of the house's beautiful surroundings. The deck seems to lead you out into the lush forest, and the property's plot of grass and pool-side shrubs fit right in with the gorgeous rural landscape. It's not just the nearby ocean that this house is built to take advantage of, the green-space gets its fair share of consideration in the design. The sense of motion in the wood panels begins right here. You may notice that your eye is drawn along the ridges up the left side, across the roof, and down the right. The feeling of movement is fitting for an entryway, and the crisp white stacked planters keep the style modern. 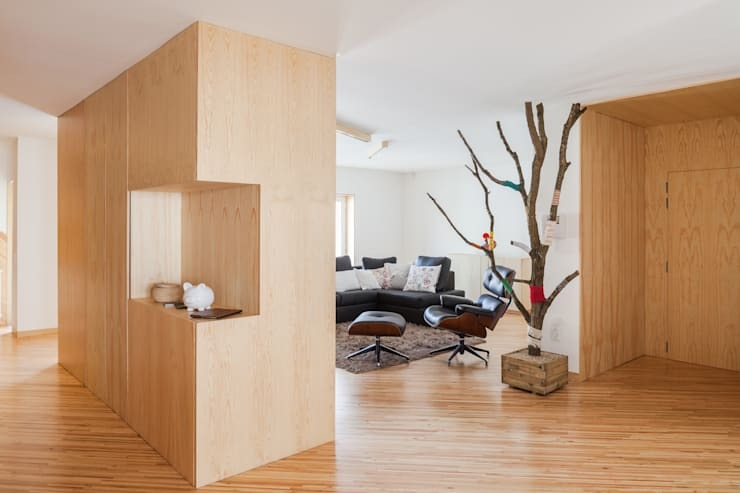 The interior of the house relies on the pairing of white and wood as well. This study has been designed with the client's needs in mind, the amount of storage space is simply astounding. The same angled wood pattern can be seen on the floor, making transitions between spaces easy and unifying the home's style. This simple modern living room achieves a balance between bright and private. 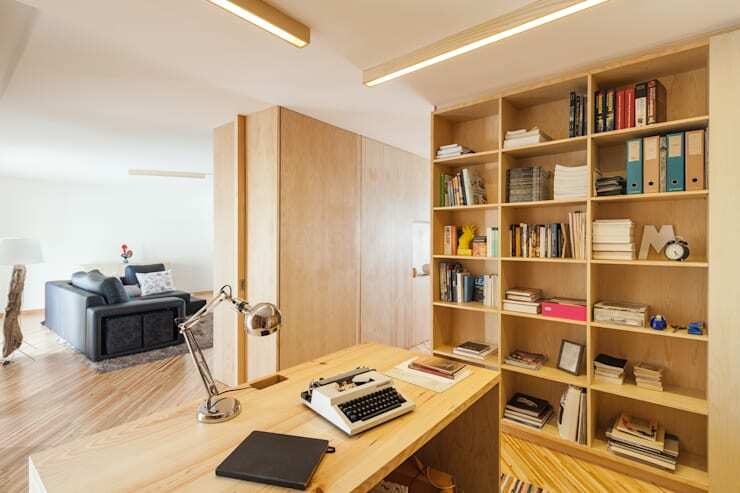 The wooden shelving units allow for some personal touches from the owner, and create the feeling of privacy. That rustic tree brings a touch of nature indoors, and provides a surprising amount of colour with it's vibrant sleeves. Overall, its a comfortable and clean space. If you're looking for a nature-inspired home that relies more on stone patterns than wood, you'll love this gorgeous home. That huge window makes for some amazing natural light in a very functional room. This space is multi-purpose as both a dining area and a conference room for the client's work. It's simple design allows for easy transition between these private and public uses. All of the table settings and stemware can be tucked away in the ample storage and even the wine storage is out of the way. If you prefer something more extravagant for your wine collection you'll want to take a peek at our amazing wine cellars. 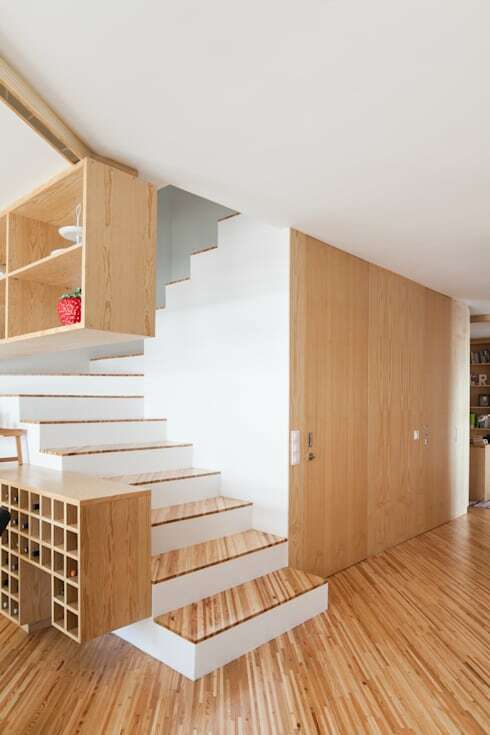 This stair space is simply the opposite of cluttered with its sharp white facing. 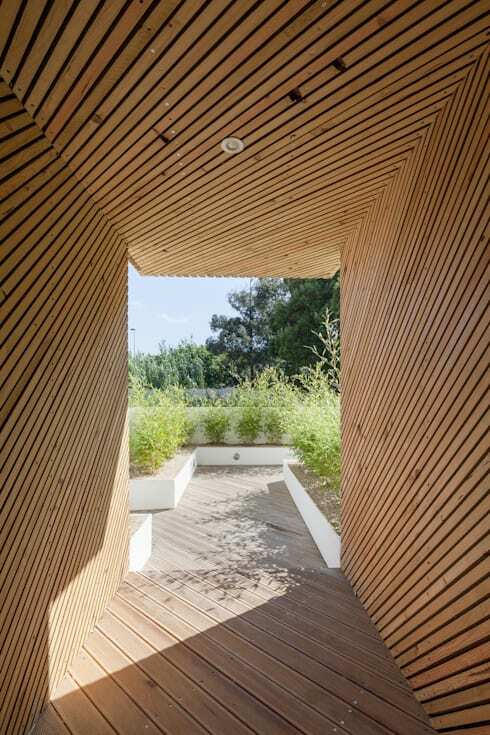 The wood is used minimally here, but to lovely effect with the diagonal pattern that lends some visual interest. We imagine that natural light from the dining area follows you all of the way up these bright white stairs. What was your favourite element of this dream home? Let us know in the comments!